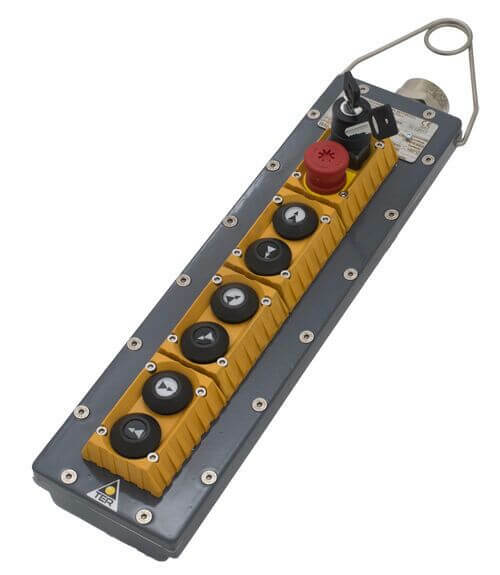 The Mike-X series explosion proof pendant is designed for use in industrial areas and hazardous areas with ATEX and IECEx certification for zones 1, 2, 21, and 22. The Mike-X is available with 4-16 actuators, two speed push-buttons and key selector switches in a variety of operational configurations. Each actuator can be fitted with up to 3 contacts (NO & NC available), and connecting jumpers are available to reduce wiring time. The special explosion proof housing is made of an epoxy painted aluminum or steel which is strong, but still lightweight, however it is not recommended to support the pendant from the power supply cable. A holding hook is included for supporting the pendant when not in use. Thermal protectors and anti-condensation heaters are available as options. All materials and components used are shock and wear resistant, and guarantee protection against water, dust and oils.